“LED: From Adversity to Destiny” from Christian Faith Publishing author C. Bryan Crosby is a helpful guide for those looking to find a greater resiliency for life’s trials and grow closer in their relationship with God. 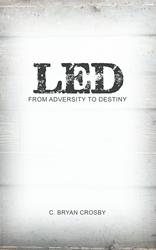 “LED: From Adversity to Destiny”: an insightful and candid book that gives readers the tools needed to overcome struggles and seek out the kingdom of God. “LED: From Adversity to Destiny” is the creation of published author, C. Bryan Crosby, whose childhood was filled with adversity, and who, after facing many trials, has become a student ministries pastor at the Vision Church in Valdosta, Georgia. He holds a bachelor’s degree in pastoral leadership from Faith Christian University, and is a proud husband and father. Published by Christian Faith Publishing, C. Bryan Crosby’s new book is influenced by the Holy Spirit, and is meant to help readers understand that success never comes without failure, but if one fixes their eyes on Christ, they can accomplish more than they thought possible. Crosby’s understanding is that life is a series of trials and victories proven by those who have faced their fears with unshakable faith and refused to be broken by the challenge. Trials offer an opportunity to find out what each individual is made of, and by focusing on what followers of Christ are made for, readers can find the strength to overcome anything. View a synopsis of “LED: From Adversity to Destiny” on YouTube. Consumers can purchase “LED: From Adversity to Destiny” at traditional brick & mortar bookstores, or online at Amazon.com, Apple iTunes store, or Barnes and Noble. For additional information or inquiries about “LED: From Adversity to Destiny”, contact the Christian Faith Publishing media department at 866-554-0919.